Yep, that's what I revealed in today's The Austin Chronicle according to a very solid source. 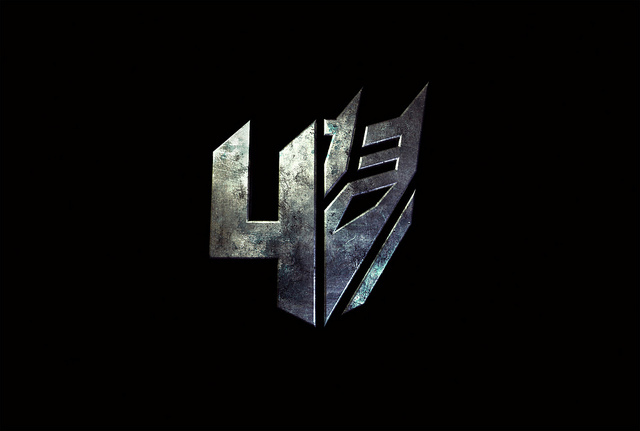 Apparently there's a race car driver from Texas in Michael Bay's Transformers 4 pic, which already has a web site up, a fancy logo and release date of June 2014. Oh, and Mark Wahlberg is back. 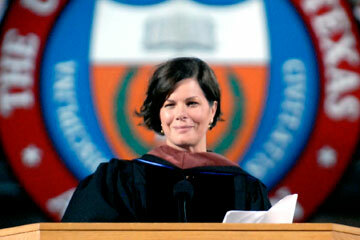 Add Zach Efron and University of Texas grad Marcia Gay Harden to the cast of Tom Hanks-produced Parkland, which tells of the goings on at Parkland Memorial Hospital in Dallas on the day President John F. Kennedy was assassinated in 1963. They join Billy Bob Thornton and Paul Giamatti in the film, which is set to shoot in mid-January in Austin. I'll have a mention of the film--including why they choose to shoot in Austin instead of Dallas--in Thursday's The Austin Chronicle. My brief will also tell you about a "major Hollywood film" that will be shooting in Austin soon, too. Think things that move... Look for the link here shortly. 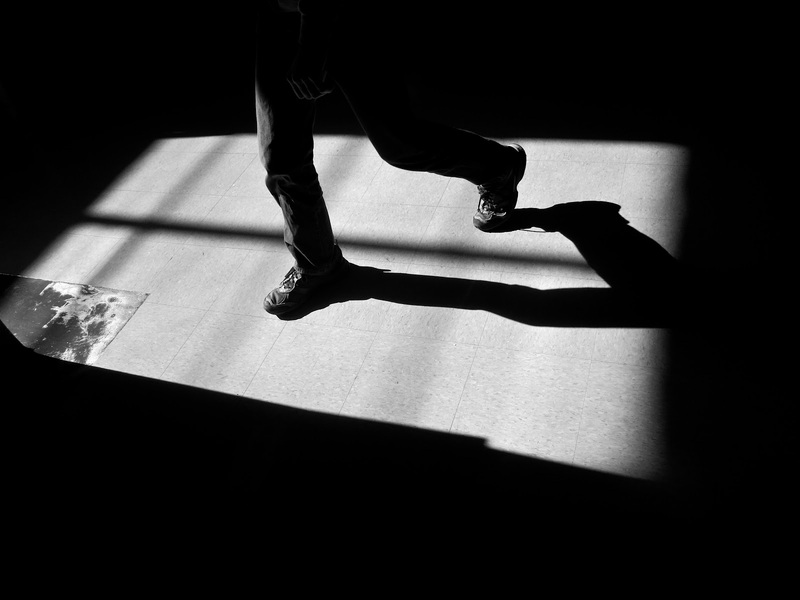 Walking the shadows at Austin Community College. See more of my photos on flickr here. 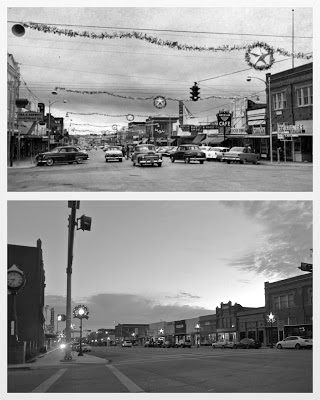 A friend sent me a photo of Taylor, Texas, taken at some point in the 1950s during the Christmas season. I went downtown and took my own photo of the same block. 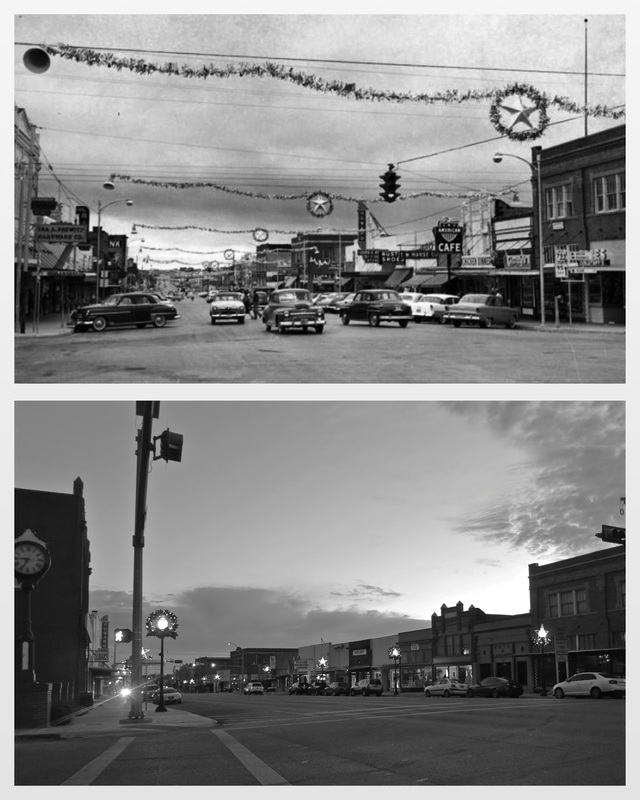 It's not such a bustling place anymore, the Howard Theater moved across the street, the parking alignment changed and the Christmas decorations are a bit more low key. Otherwise the similarity is striking. 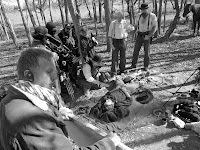 Here's my report for The Austin Chronicle from the set of Duane Graves and Justin Meeks' Western Red on Yella, Kill a Fella. You can also see a slideshow of my photos, including cult actor Michael Berryman in action. The pair report that Boneboys, which they directed from Kim Henkel's script, is this close (see my fingers inching together?) to a sale. Robert Rodriguez has proven he can shoot a film more quietly with big-name stars than just about anyone (it's all that green screen time). But, yes, Sin City: A Dame to Kill For, continues to shoot in Austin intermittently this month and "goes full force" in January. Last we heard much publically from a Rodriguez set he had closed downtown streets for a late-night Machete 2 shoot. According to The Hollywood Reporter, Dennis Haysbert has taken the role of Manute, portrayed by the late Michael Clarke Duncan in the original 2005 Sin City based on Frank Miller's comic books. 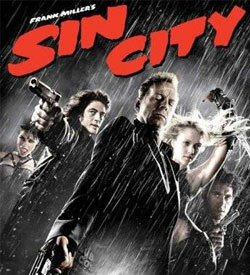 Returning for the sequel are Mickey Rourke, Jessica Alba, Jaime King and Rosario Dawson. 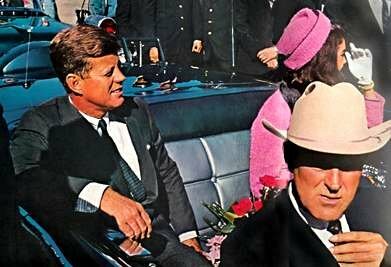 Hmm...so why is a Dallas-set film about the assassination of President John F. Kennedy filming in Austin? Beats me, but that's the plan for Parkland, which is set to shoot (no pun intended--seriously) in the Capital city in January and February of 2013. The cast includes Billy Bob Thornton, Paul Giamatti and Jacki Weaver. Tom Hanks is producing.The name comes from Parkland Memorial Hospital where JFK died after being shot in Dallas on Nov. 22, 1963. 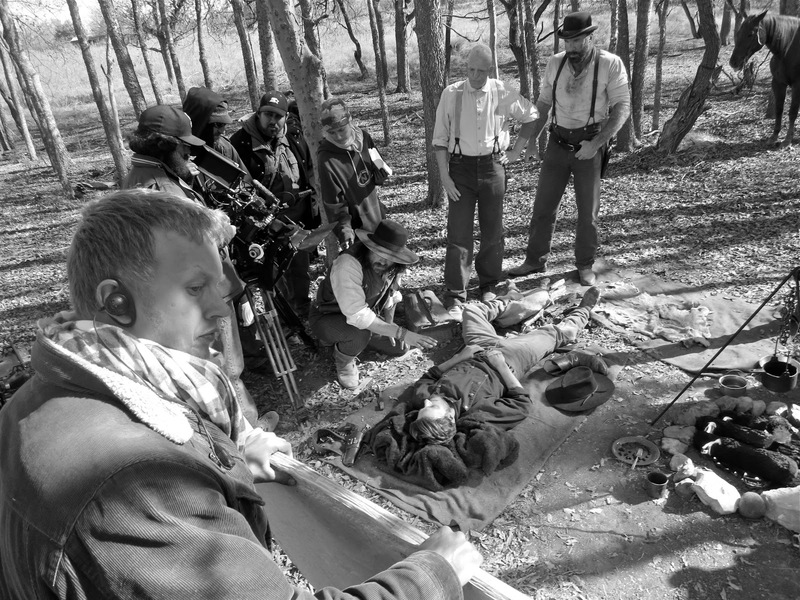 An extras--and speaking role--casting call is set for Sunday, Dec. 16 from 11 a.m.-5 p.m. at the Clarion Inn & Suites, 2200 S I-35. The want Secret Service agents, lookalikes for JFK, Lyndon Johnson, John Connally, the beautiful Nellie Connally, Dallas police, reporters and the general public. You can also sign up for nonspeaking roles online here.